A luxurious holiday home in an exceptional loch side position in Melfort, Argyll. Beautiful views, peace and solitude amongst some of the finest scenery in Scotland. Spectacular views, private fishing, wonderful walking, stunning scenery - what more could you ask for! 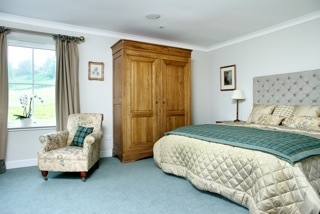 Fearnach Bay House is located in a peaceful secluded corner of the owner's 1000 acre private estate and working hill farm. It has been built and furnished to an exceptionally high standard and offers everything you could need for a luxurious, relaxing and peaceful holiday. Within a short stroll from its own private shoreline, this delightful holiday home is in an enviable position overlooking the yachts moored in Loch Melfort. The house enjoys a southerly aspect and has the magnificent Melfort Hill standing behind it which offers breathtaking views over the nearby islands of Scarba, Luing, Jura and Islay. The house is also within walking distance of the renowned "Shower of Herring" restaurant, allowing you to have a rest from cooking and truly relax! The estate is a haven for wildlife and there are many tracks and pathways just waiting to be explored on foot, taking you along the shore, through the woods and over the hills. For those who enjoy fishing, there is a small rowing boat for guests use which can be launched from the slipway directly in front of the house, providing guests with the perfect opportunity to fish for their supper! The estate also offers guests the opportunity to enjoy complimentary trout fishing on two of the estate lochs and fishing on a further twelve lochs is available in the vicinity (permits can be purchased at the local Post Office). There are plenty of other activities to enjoy in this wonderful area. The world renowned championship golf course at Machrihanish is just over an hour's drive and there are two courses closer to home: the challenging 18 hole course at Oban and the 9 hole course on Seil island (both within half an hour's drive away). Why not experience the thrill of galloping along deserted beaches, or exploring the hills of mid Argyll on horseback. Alternatively take an exciting excursion by boat through the Corriervreckan whirlpool (the third largest whirlpool in the world) where you may see grey seals, red deer and golden eagles or visit one of the spectacular gardens of Argyll. Oban is the port from which ferries sail to many of the island of the Inner Hebrides: Iona, Mull, Staffa and Fingals's Cave are all within easy reach and make a great day excursion where you can enjoy magnificent scenery. 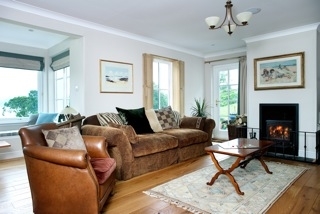 At the end of your day, arrive back at Fearnach Bay House and relax in front of the log fire, sink into the luxurious sofas to enjoy a cosy evening in. Or have a barbecue (all the kit is supplied) on the secluded patio and enjoy a wee dram as evening draws in over the loch.